Most mornings I eat eggs for breakfast. 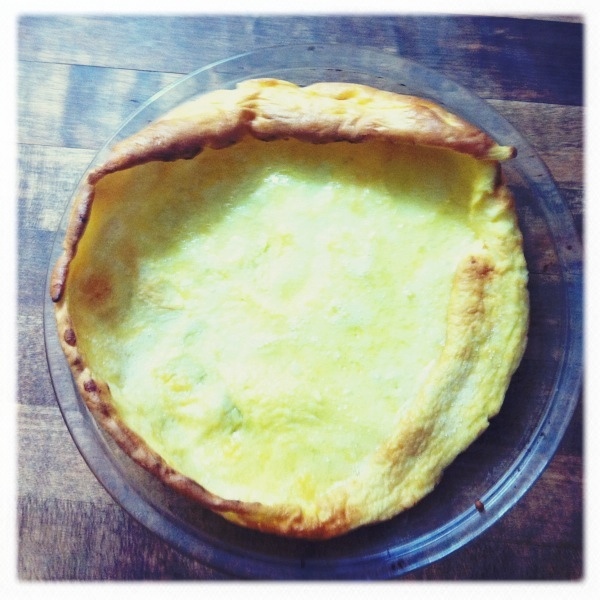 But lazy weekend mornings at home call for a Dutch Baby. Puffed in the oven and eaten with bacon, all you need to add is a nap and the paper for a perfect morning. If you’re not a morning person, they’re also good savory for dinner. Swap out herbs, cheese and tomato sauce for the lemon-sugar finish. Melt butter in the oven in a medium sized skillet or oven proof ceramic or glass pie plate. Stir together the egg, flour and milk until thoroughly combined. When the butter is hot and sizzling, pour the batter into the pan and turn down the oven to 425. Bake 12-15 minutes until puffed and golden. Squeeze lemon juice over the hot Dutch Baby and sprinkle with powdered sugar. Serve with additional powdered sugar and jam. This entry was posted in BITE, Food, Uncategorized. Bookmark the permalink.